If I said I was going to the seaside, what is the first thing that pops inside your head? Ice-cream? Soft drinks? Sandy beaches? You probably would not think yard sales, charity shops and vintage computer software. Well that’s how we roll at BMV, never stopping in our quest to find old bits of computer paraphernalia. On this occasion I discovered a boxed copy of Wordstar 3.40. The box comprises of one thick reference and installation manual, another thinner training guide and a starter kit containing two floppy disks. Some of you may or may not be familiar with Wordstar. You can be forgiven for not recognising the name. But what if I told you writers such as George R.R Martin (Game of Thrones), Arthur C. Clarke (Space Odyssey) and Robert J. Sawyer swear by the software? 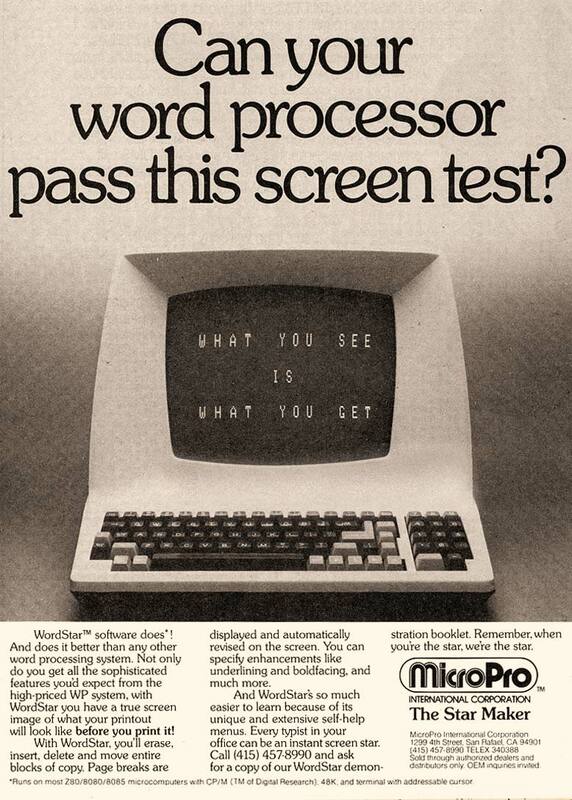 Released in 1979, Wordstar became one of the most widely used Word processors during the early 80s. Amongst its strengths was the fact the software was not computer specific. Originally developed for the CP/M operating system, Wordstar was intended to run on just about any CP/M computer, regardless of brand. Later in 1983 with the rising popularity of DOS based computers, Micropro released a new version, Wordstar 3.0. A direct port of the CP/M version, 3.0 retained many of the original keyboard short cuts making it easy for CP/M users to continue using the software on a newer DOS based platform. You might be wondering why I’m bothering with such an old piece of software and not using Microsoft Word. It’s true using Word with it’s easy to use GUI and icons would probably make things very easy, mainly because I have been using Word since I was in my teens. But should I rule out other ways of doing things, just because I’m accustomed to one way? Personally I like variety, I also like DOS and old software; DOS, old software and old computers. If there is a theme or purpose to my blog, it’s to show people that there are still ways to get things done using old hardware. Distractions like Facebook and the internet can sometimes get in the way of productivity. Goodness knows I’ve lost track of time while pottering around on the net, getting very little done in the process. So today, armed with a cup of coffee, I sat down with the Nomad running Wordstar via DOSbox. After an hour or two I was able to get this entire blog entry written. Admittedly it will need proof reading before I upload it to WordPress, as I do not have the Spellstar add-on. Learning the keyboard layout will be the hardest challange. IBM compatible machines do not have the same keyboard layout as early CP/M computers, so not everything is where you might expect it to be. If I have one gripe about Wordstar, it would be the default blue page background which I find hard on the eyes while typing. For the vast majority of the time, I found looking down at my keyboard helped. Which in turn caused me to focus on my typing and actually improved my typing speed and decreased my typos… well, to at least a small degree. The procedure described below could cause unrecoverable damage to the s9920, by proceeding you are accepting full responsibility for any damage, loss of limbs, exploding sheep that might occur. In other words don’t blame me if it doesn’t work! 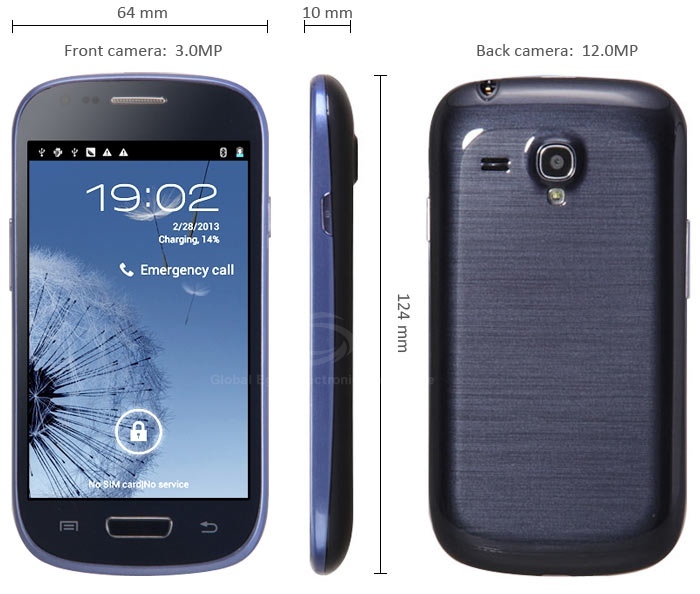 A while ago I wrote an article regarding S9920 handset, covering some of the short comings of the S3 Mini clone. I have to say since I writing that article, I have received messages from several of you. Many asking if I had figured out how to fix the phone and where to source spare parts. Sadly I wasn’t able to offer much help. Aside from a few threads regarding rom’s, there isn’t all that much on-line covering this device. After writing the article, not much has happened. The phone has sat in my desk drawer awaiting its fate. So what has changed you ask? Well recently I did a little on-line research, to find out whether anyone had figured out a way to resolve the problems with the S9920. Namely the ghost touching, which almost renders the device useless as a phone. As it transpires, there might actually now be a fix. The information I found wasn’t posted one any forum, nor was it that easy to find. In fact when I came to write this article, it took me almost 30 minutes of retracing my steps before I found the original source. So if you’ve been looking recently and not found anything, seriously don’t be kicking yourself, it’s easily done. The original author of the fix, user “Speedylaci”. Believed the fault with the touch screen resided in the cable connecting it to the logic board. More specifically two solder points, which they believe are weak and causing a bad connection. They suggest disassembling the device and reflowing the two points. Other posts I have read suggest using a small amount of glue to fix the digitisers connector down on to the logic board. After some users observed the connector comes off too easy and could contribute to the digitisers odd behavior. If you have not performed or read about the fix previously described on ByteMyVdu, now might be as good a time as any to check out the following link and familiarise yourself with it. Needless to say the fix outlined in the aforementioned article did not solve my problems. So reading about another possible means to fix came as welcome news. Better still that it is a very easy repair to perform. Following the instructions from my previous article, unscrew and remove the back panel of the phone. 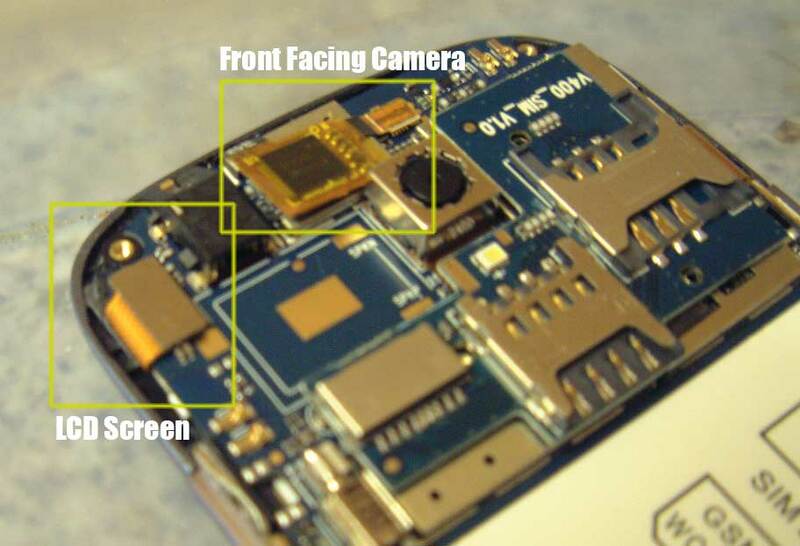 This should now leave you with the PCB and camera module exposed (see fig 1). Above the power button you should see a small cable connected to the motherboard, this is the connector for the LCD which needs securing in place. It is up to you how you do this, some people have used glue, others adhesive tape. If you decide to use glue, keep in mind that too much could irreparably damage the phone. The last thing you want to do is gum up the connector and prevent it from making a circuit. A little glue on the outside between the connector and the cable should be fine. Leave it to dry before re-assembling the device. With a little luck this might improve the digitisers performance, it certainly can’t make it any worse. My handset had been sitting in my desk drawer for over 6 months, so I didn’t care whether it worked or broke the phone even more. The fact is I’d written off the S9920 long ago, so bricking the phone really didn’t worry me. If this is something you’d rather avoid, then I suggest you don’t perform the procedure above. Having performed the fix on my handset, I sadly can’t tell you if it solved my problems or not. The screen has not acted up since doing the repair, but given that the fault occurs randomly, only time will tell.